Here we go guys. Week 11 is upon us and I hope your IDP players are playing well if not here are the IDP Waiver Wire Week 11. Avery Williamson (TEN): Second year player and starting to play more and more. If you are an a dynasty league he won't be available but if not pick him up as a LB2 right now. Kwon Alexander (TB): I am all in on this 4th round pick. He didn't have a huge week 10 but I LOVE his potential and he will get you both tackles and big plays! I strongly recommend you pick him as a Low end LB1 with big UPDSIDE! 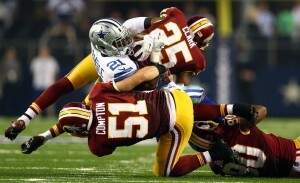 Will Compton (WAS): I am big homer and I admit it but Will Compton started this past week and played extremely well, he finished with 8 tackles and I think he is in for the starting job in DC vs Carolina which is a great matchup. Brian Orakpo (TEN): OKAY this is FOR BIG PLAY LEAGUES only! RAK has been on a tear for the past 3 games with 4 sacks and 12 tackles! Linval Joseph (MIN): One of the reasons for Minnesota's great defense is this guy! Past 2 weeks he has 18 tackles, 1.5 sacks, and a forced fumble! He is facing a Green Bay offense that looked fragile for a few weeks now! Isa Abdul-Quddus (DET): IF Ihedigbo is a no go next Sunday this guy can be a nice replacement for you. Had a solid game in week 10.